Senate Bill 1176 Would Block Efforts To Enable Public Disclosure From Nonprofit Organizations That Spend Anonymous Money To Influence Voters. LANSING (NOV. 28, 2018) — As introduced, a new bill before the Michigan Senate made no mention of campaign finance. But it could have a significant impact on dark money in politics going forward. Introduced two days after the election in the lame duck session, Senate Bill 1176 would create a new law called the “Personal Privacy Protection Act.” The act would ban any government agency, state or local, from requiring nonprofit organizations to disclose information about their financial supporters. That includes nonprofit organizations that spend millions of dollars trying to sway voters in the days before an election. It would also ban agencies from requiring government contractors to disclose contributions they’ve made to political nonprofit organizations. In an interview with Bridge Magazine earlier this month, Sen. Mike Shirkey, a Republican from Clarklake and the bill’s sponsor, said he wanted to ensure that nonprofit organizations, political or not, are protected from having to disclose their donors. The bill could impact campaign finance because of how wide-ranging its “punctuation point” is. 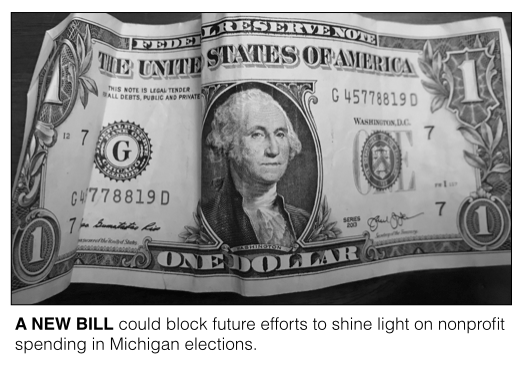 The bill treats donors to charitable organizations that are banned from getting involved in campaigns the same way it treats donors to social welfare organizations that can and do spend millions of dollars on campaign advertising in Michigan. While there currently is no requirement in Michigan for these types of nonprofits to disclose where their political money is coming from, public officeholders have made efforts in other states to require the disclosure of donors to groups trying to influence elections. The bill would block future efforts in Michigan to shine light on these groups’ funding sources and would levy a misdemeanor offense against public officeholders who tried to require such disclosure. The new bill aims to prohibit the identification of the donors of all nonprofits organized with the federal government’s 501(c) designation. There are many types of nonprofits, including 501(c)(3) charitable organizations, like churches, food banks and think tanks. 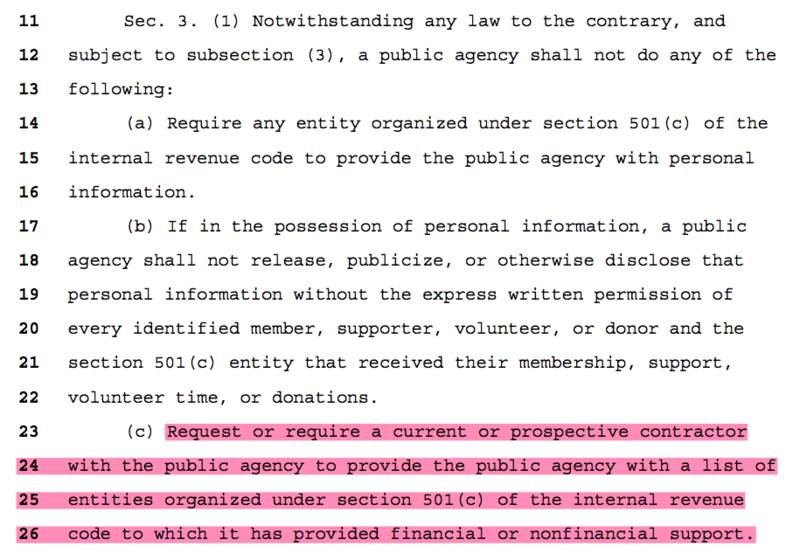 This type of nonprofit can receive tax-deductible contributions and is barred from partisan involvement in campaigns. But there are other types of nonprofits, including 501(c)(4) social welfare organizations and 501(c)(6) business leagues, that are nonprofits but generally can’t receive tax-deductible contributions. These types of nonprofits can spend money to influence elections and currently in Michigan, they don’t have to disclose where their money is coming from. One way they can do this is through independent spending on campaign advertisements that either support or oppose candidates. In Michigan, nonprofits that advocate for a candidate’s election or defeat report their spending totals to the Michigan Secretary of State but do not report the sources of their money. They cannot coordinate their spending with candidates or campaigns. For instance, Americans for Prosperity, a 501(c)(4) social welfare organization, spent $3.9 million this year in opposition to Democratic gubernatorial candidate Gretchen Whitmer. Another way nonprofit organizations get involved in politics is through funding “issue ads” that either slam or praise particular candidates. In Michigan, advertisements that don’t expressly tell people how to vote aren’t subject to any campaign finance disclosure requirements. So, nonprofits can fund ads that criticize a candidate who’s on the ballot without reporting where their money is coming from or even how much they’re spending. The Michigan Campaign Finance Network tracked about $3 million in “issue ads” aimed at Michigan Senate candidates this year. A nonprofit called Michigan Citizens for Fiscal Responsibility, which is connected to GOP consultants, spent about $1.1 million on negative ads about Democratic candidates for the Senate. Another nonprofit called Citizens for Energizing Michigan’s Economy spent an estimated $830,000 on TV ads praising a bipartisan group of candidates for both the House and the Senate this year. The spending included an estimated $253,000 in support of Democratic Senate candidate Henry Yanez in the 10th District and $185,000 in support of Democratic House candidate Sarah Schulz in the 98th District. Nonprofit organizations also heavily support ballot proposal campaigns. For instance, Voters Not Politicians, the successful campaign to institute an independent redistricting commission, received $5.5 million from the Sixteen Thirty Fund, a nonprofit based in Washington D.C. The original sources of the money didn’t have to be reported. Nonprofit organizations can also fund super PACs. Super PACs that can receive unlimited contributions from corporations, including nonprofit organizations, are becoming larger players in Michigan elections. A record number of super PACs, 39, were among the largest 150 PACs in Michigan this election cycle. Nonprofits can give money to super PACs without reporting where their money is coming from, meaning they could potentially shield the identity of a super PAC donor. One of the top donors to Better Jobs, Stronger Families, the super PAC that supported Republican Bill Schuette for governor, was the nonprofit Fund for Michigan’s Tomorrows, which gave $300,000. Another example of how nonprofits influence politics is many Democratic and Republican officeholders in Michigan have set up nonprofit accounts to raise money for non-campaign related activities, like travel and community events. It’s impossible to know exactly how many state officeholders have such accounts set up to receive corporate contributions. But in 2016, an investigation by MCFN and MLive found at that time, there were dozens of such nonprofit accounts. For instance, Gov. Rick Snyder has been connected to multiple nonprofits including one known as the NERD Fund and another called Making Government Accountable. Making Government Accountable reported raising $2.2 million in 2015 without reporting where any of the money came from. Other states have acted to shine light on the donors to political nonprofits. These types of requirements would be barred under Senate Bill 1176. For instance, the New Mexico secretary of state, Maggie Toulouse Oliver, created a rule in 2017 that required groups that run ads referring to candidates 30 days before a primary election and 60 days before a general election to disclose information on their donors. In Montana, the governor signed an executive order earlier this year to require state government contractors to disclose information on their giving to dark money groups. Senate Bill 1176 would specifically ban such transparency provisions in Michigan. At the federal level, courts ruled earlier this year that the Federal Election Commission wasn’t properly enforcing federal law because it failed to require disclosure from nonprofits that spent money telling people how to vote. The U.S. Supreme Court declined to take up a challenge to the ruling, meaning the FEC has to begin enforcing such disclosure. According to a 2015 study by the Center for Public Integrity, Michigan ranks 50th out of all 50 states for government accountability and transparency.